Do you want to learn how to sew? Our introductory course will familiarize you with the sewing machine and what it does, interfacing, patterns, taking measurements, doing alterations, fabric layout, hemming and selecting fabric. Each student will create a simple project of their own choice. Please bring a tape measure, pencil and paper. Additional supplies will be discussed during the first class. No previous sewing experience is necessary. Have fun and learn intermediate techniques by making a shirt. Techniques learned are assembling a collar, cuffs, sleeves, placket, buttonholes, button attachment, hemmingm using pressing equipment, fitting and alterations. A pattern and a bobbin are included in the course fee. Additional supplies will be discussed in the first class. To register for this class, students must have completed the course Sewing for Beginners or have equivalent basic sewing skills. This course is an introduction to the serger, a machine that is used in addition to a traditional sewing machine. The first class will discuss the basics of the serger, threading, tensions, and operation of the machine. In the remaining classes, each student will make a simple t-shirt. Students must bring their own serger in good working order to each class; this class is open to all makes and models of sergers. Don’t forget to bring the power cord and the manual and all accessories that came with the serger. 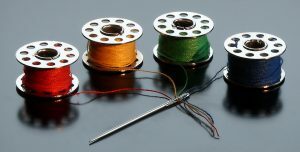 Bring 4 different colours of cone thread for sergers. No previous sewing experience is necessary. This workshop offers the opportunity to work independently on a project of your choice, or to finish a project with guidance from the instructor. The class size is limited to 10 students for personal attention. Please bring your pattern, fabric (pre-washed) or project and all necessary sewing notions to the first class. Please ensure the class is confirmed before purchasing materials. To register for this class, students must have completed the course Sewing for Beginners or have equivalent basic sewing skills.